Outdoor Living Landscape, LLC. is a professional outdoor lighting installation contractor. We provide professional low voltage lighting installations throughout Ocean, Monmouth, Burlington and Atlantic Counties in New Jersey. Company owner Ron Brown works closely with Manalapan homeowners to achieve the exact lighting effects they desire for the outside areas of their home. As a Manalapan low voltage lighting contractor, Ron and his crew will custom design layouts for deck lights, garden lights, driveway lighting or a complete home outdoor lighting system. Ron and his crew work exclusively with attractive high quality, energy efficient, low voltage fixtures that will compliment your outdoor areas. 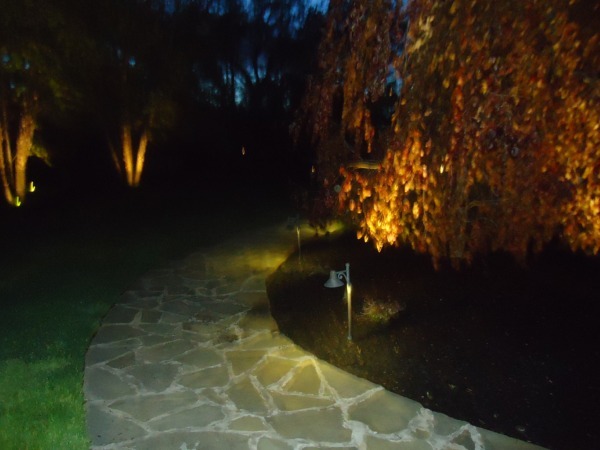 Manalapan landscape lighting installation services by Outdoor Living Landscape, LLC. helps to increase property values while providing an additional level of home and property security. By keeping the perimeter of your home well lit you can help to prevent unauthorized access before the fact. Our Manalapan low voltage lighting design services start with a FREE Outdoor Lighting Demonstration. Company owner Ron Brown likes to meet with clients at their home to discuss outdoor landscape lighting fixture, wiring options, fixture types and recommended lighting fixture placement. 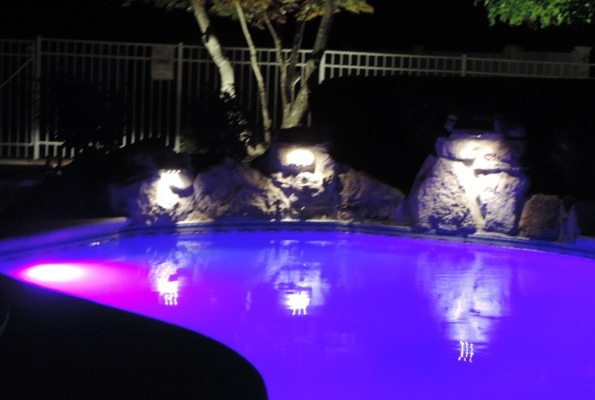 Ron and his crew offer clients a free night time demonstration that will illuminate your yard, deck or pool area with low voltage landscape lighting. Creating great lighting effects that showcase deck areas, flower gardens, swimming pools and entryways is a skill learned through extensive training, experience and countless LED installations. Manalapan lighting maintenance, Manalapan deck lighting, garden lighting, walkway lighting, driveway lighting and lighting retrofits are all part of the service offered by Ron and his crew. Older landscape lighting that uses outdated halogen or incandescent bulbs should be upgraded to energy saving and long lasting outdoor LED fixtures and bulbs. It really is an easy decision to make once you see the dollar savings that upgrading provides. Light Emitting Diodes or LED's, are the most efficient form of lighting available today. LED lighting use less than half of the electrical power required by fluorescent lighting and less than a quarter of the power used by most incandescent outdoor lighting. LED lighting systems are very capable of emitting similar amounts of light, providing the desired lighting effects without compromise. The unique semiconductor based structure of Light Emitting Diodes means they will provide extended life giving you much greater financial value over time. As a full service Monmouth County outdoor lighting contractor, Outdoor Living Landscape, LLC offers Manalapan NJ residents a complete service that includes design, installation and retrofits. Landscape lighting maintenance inspections are a process that should be done on a yearly basis. The trimming of branches and shrubs that grow around fixtures is important for proper outdoor lighting function. The yearly checking and repositioning of ground level LED fixtures that can be accidently redirected from their intended lighting area by landscapers or kids playing is an important part of maintenance. Accurately directed lighting for your home and landscaped areas is why you installed outdoor lighting in the first place, to keep it performing as intended for many years, have lighting direction inspected yearly. Low voltage lighting maintenance does not require a lot of bulb changes because the LED's outlast incandescent light bulbs by years, but positioning and direction change as trees and shrubs mature and fixtures get misdirected. As a low voltage lighting contractor Ron Brown and his team service Manalapan NJ 07726 and surrounding towns. 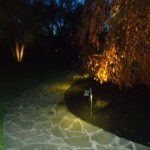 Holiday Lighting Manalapan NJ 07726 by Outdoor Living Landscape, LLC. Festive lighting is an important part of the holiday season and many Manalapan homeowners love to add to the occasion by going all out. Unfortunately Holiday light installation from a ladder or roof top is among the most hazardous of DIY projects. Let Ron Brown work with you to design the low voltage Holiday lighting that will bring the Holiday season to life at your home. Once the design is complete Ron and his team will expertly install your Holiday season lighting. After the Holidays and in the middle of the winter, Ron will return to safely take down and store your lighting away for next year. All lighting is installed by a licensed NJ Electrical Contractor. License will be provided upon request. Outdoor Living Landscape LLC of Brick NJ – Commercial LED Installation at FirstEnergy Park home of the Lakewood Blue Claws minor league baseball team. Company Owner Ron Brown and his crew installed LED lighting in the childrens playground section of the stadium. FirstEnergy Park Lakewood New Jersey draws over 400,000 visitors each year and needed to upgrade the quality of lighting provided as well as reducing the energy consumption used to power the lighting. High Quality Light House LED Fixtures provide energy savings of about 90% over traditional incandescent lighting. The stadium had been utilizing holiday type string lighting over the playground area. Burned out bulbs were hard to replace and the general appearance of the lighting was not up to the standards of the beautiful ball park. High quality solid brass LED fixtures were mounted on the existing light poles. The fixtures used were manufactured in the USA by Lighthouse Lighting. The solid brass fixtures use a 7 watt LED bulb that used 90% less electric power which creates a payoff of the new lighting in approximately 3 years (great investment). Other products used on this Ocean County NJ LED installation were a low voltage transformer and 10/2 electrical wire. 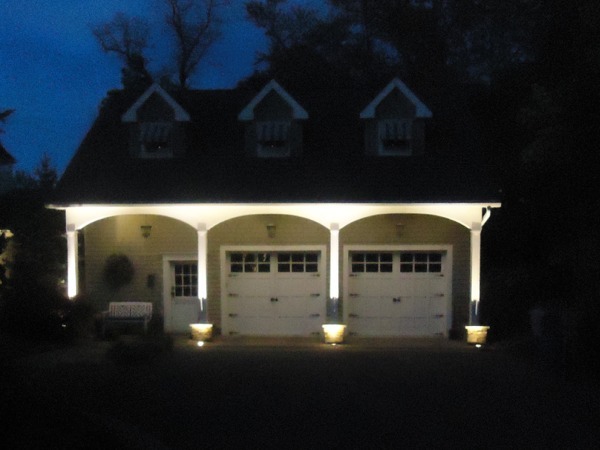 As an Ocean County Architectural Lighting Contractor, Ron and his crew provide free outdoor illumination demonstrations for homeowners and commercial businesses looking to improve the night time appearance of their property while increasing safety and security. 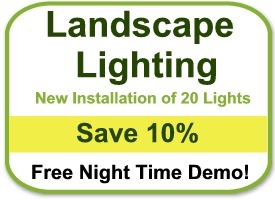 Call or email today for a free outdoor lighting demonstration at your home or business. Outdoor Living Landscape, LLC. 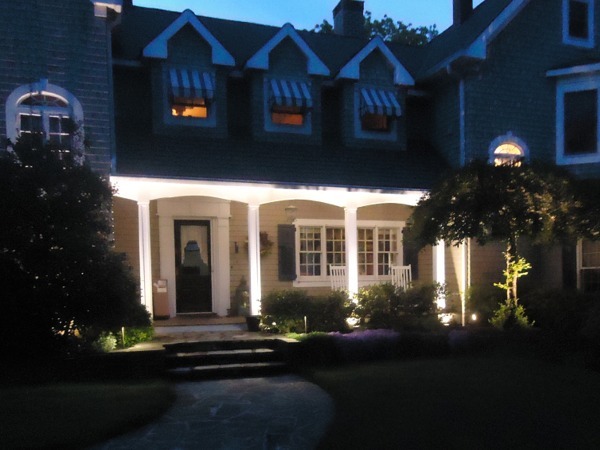 is a professional outdoor lighting installation contractor providing services throughout Ocean County, Monmouth County, Burlington County and Atlantic County New Jersey. Company owner Ron Brown works closely with Jackson homeowners to achieve the precise outdoor LED low voltage lighting effects they desire for the outside areas of their property. 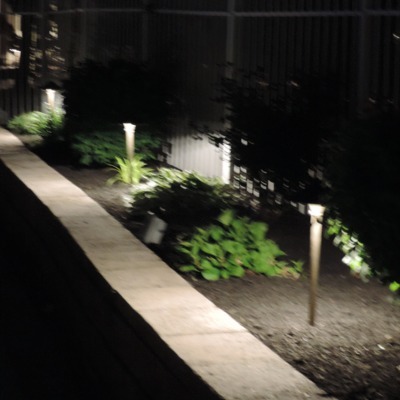 As a Jackson NJ low voltage lighting contractor, Ron will custom design lighting layouts for deck lighting, garden lights or complete landscape lighting. Ron and his crew work exclusively with high quality, energy efficient low voltage fixtures that will compliment your surroundings. Jackson landscape lighting installation services by Outdoor Living Landscape, LLC. increases property values while providing an additional level of home and yard security. Keeping the perimeter of your home well lit during dark hours helps to deter unauthorized entry. Our Jackson low voltage lighting design services start with a professional free outdoor lighting consultation. Company owner Ron Brown likes to meet with clients at their home to discuss outdoor landscape lighting fixture, wiring options, fixture types and recommended lighting fixture placement. Ron and his crew offer clients a free night time demonstration to demonstrate exactly what a well lit home and outside perimeter will look like with low voltage landscape lighting. Creating great outdoor lighting effects to showcase deck areas, flower gardens, swimming pools and entryways is a skill learned through extensive training, experience and numerous installations. Landscape lighting maintenance, deck lighting, garden lighting, walkway lighting, driveway lighting and lighting retrofits is part of the service offered by Ron and his crew. Older halogen or incandescent landscape lighting upgrades [ to energy saving and long lasting outdoor LED lighting is an easy decision to make once you see the energy and dollar savings that upgrading provides. Light Emitting Diodes or LED's, are the most efficient form of lighting available today. LED lighting use less than half of the electrical power required by fluorescent lighting and less than a quarter of the power used by most incandescent outdoor lighting. LED lighting systems are very capable of emitting similar amounts of light, providing the desired lighting effects without compromise. The unique semiconductor based structure of Light Emitting Diodes means they will provide extended life giving you much greater financial value over time. As a full service Ocean County NJ outdoor lighting contractor, Outdoor Living Landscape, LLC offers Jackson NJ residents a complete service that includes design, installation and retrofits. Landscape lighting maintenance inspections are a process that should be done on a yearly basis. The trimming of branches and shrubs that grow around fixtures is important for proper outdoor lighting function. The yearly checking and repositioning of ground level LED fixtures that can be accidently redirected from their intended lighting area by landscapers or kids playing is an important part of maintenance. Accurately directed lighting for your home and landscaped areas is why you installed outdoor lighting in the first place, to keep it performing as intended for many years, have lighting regularly inspected . Low voltage lighting maintenance does not require a lot of bulb changes because the LED's outlast incandescent light bulbs by years, but positioning and direction change as trees and shrubs mature and fixtures get misdirected. As a low voltage lighting contractor Ron Brown and his team service all of Ocean County NJ. Holiday Lighting Installation Jackson NJ by Outdoor Living Landscape, LLC. Christmas lighting is an important part of the holiday season and many Jackson homeowners love to add to the festive feeling by going all out. Unfortunately Holiday light installation from a ladder or roof top is among the most hazardous of DIY projects. Let Ron Brown work with you to design the low voltage Holiday lighting that will bring the Holiday season to life at your home. Once the design is complete Ron and his team will expertly install your Holiday season lighting. After the Holidays and in the middle of the winter, Ron will return to safely take down and store your lighting away for next year. Outdoor Living Landscape LLC installed landscape lighting around a home on Battin Road in Fair Haven NJ 07704. Company owner Ron Brown and his crew of low voltage lighting professionals designed the layout to accentuate the home and landscaping features of the property. Working closely with the homeowners to provide a true custom outdoor lighting installation tailored specifically to add value, safety and security. Outdoor Living Landscape, LLC. 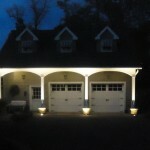 provides expert outdoor lighting installation throughout Monmouth County NJ. 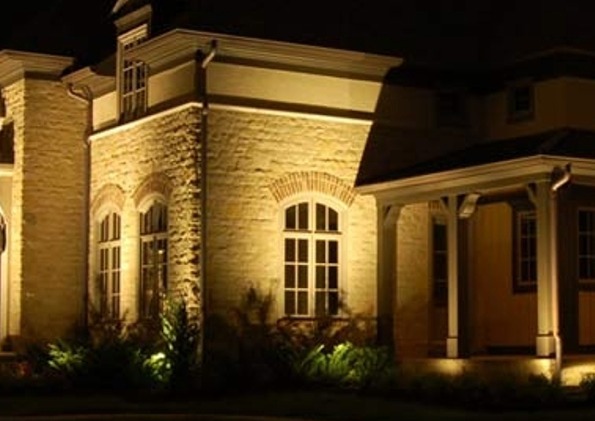 Company owner Ron Brown works closely with homeowners to achieve the perfect LED outdoor lighting effects they desire for the exterior of their homes. As a Fair Haven low voltage lighting contractor, Ron will custom design lighting layouts, recommend and install low voltage fixtures that are functional and ascetically pleasing. 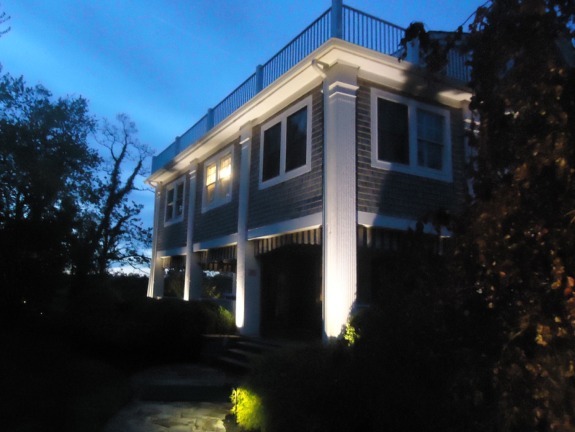 Fair Haven landscape lighting installation service by Ron Brown and his highly trained team increases property values while providing an additional level of safety and security. Keeping the outside of your home well lit during evening and night time hours helps to deter unauthorized entry. Our Fair Haven low voltage lighting design services start with a free outdoor lighting consultation. Company owner Ron Brown likes to meet with clients at their home to discuss outdoor landscape lighting fixture types and location options. Ron and his crew will arrange to provide a night time demonstration. Fair Haven landscape lighting maintenance and retrofits is part of the service offered by the Outdoor Living Landscape team. Upgrading a halogen or incandescent landscape lighting systems to energy saving and long lasting outdoor LED lighting is an easy decision to make. Light Emitting Diodes or LED's, are the most efficient form of landscape lighting available today. LED's use less than half of the power required by fluorescent lighting and less than a quarter of the power used by most incandescent lights. LED landscape lighting is capable of emitting similar amounts of light. The unique semiconductor based structure means that Light Emitting Diodes are many times more durable than incandescent light bulbs. Holiday Lighting Installation Fair Haven NJ by Outdoor Living Landscape, LLC. Christmas lighting is an important part of the holiday season and many homeowners love to add to the festive feeling by going all out. Unfortunately Christmas light installation from a ladder or roof top is among the most hazardous of DIY projects. Let Ron Brown work with you to design the low voltage Holiday lighting that will bring the Holiday season to life at your house. Once the design is done Ron and his team will expertly install your Holiday season lighting. After the Holidays and in the middle of the winter, Ron will return to safely take down and store your lighting away for next year. Outdoor Living Landscape, LLC. provides expert outdoor lighting installation throughout Ocean County, Monmouth County, Burlington County and Atlantic County New Jersey. Company owner Ron Brown works closely with homeowners to achieve the precise outdoor lighting effects they desire for the exterior of their homes. As a Toms River low voltage lighting contractor, Ron will custom design lighting layouts, recommend and install low voltage fixtures that are functional and ascetically pleasing. Toms River landscape lighting installation service by Ron Brown and his highly trained team increases property values while providing an additional level of home security. Keeping the perimeter of your home well lit during evening and night time hours helps to prevent unauthorized entry. 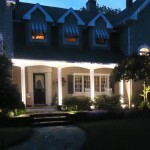 Our Toms River low voltage lighting design services start with a free outdoor lighting consultation. Company owner Ron Brown likes to meet with clients at their home to discuss outdoor landscape lighting fixture types and location options. Ron and his crew will arrange to do a night time demonstration to show clients exactly what their house and yard will look like using low voltage landscape lighting. Creating the perfect outdoor lighting effect to showcase your property is a skill learned through training, experience and dozens of highly creative low voltage lighting installations. Toms River landscape lighting maintenance and retrofits is part of the service offered by the Outdoor Living Landscape team. Upgrading a halogen or incandescent landscape lighting systems to energy saving and long lasting outdoor LED lighting is an easy decision to make. Light Emitting Diodes or LED's, are the most efficient form of landscape lighting available today. LED's use less than half of the power required by fluorescent lighting and less than a quarter of the power used by most incandescent lights. LED landscape lighting is capable of emitting similar amounts of light. The unique semiconductor based structure means that Light Emitting Diodes are many times more durable than incandescent light bulbs. As a full service Ocean County outdoor lighting design, installation and landscape lighting maintenance contractor, Outdoor Living Landscape, LLC offers a complete service. Landscape lighting maintenance is a process that should be done on a yearly basis. The trimming of trees and shrubs around fixtures is important for proper outdoor lighting maintenance Toms River and other Ocean County towns. 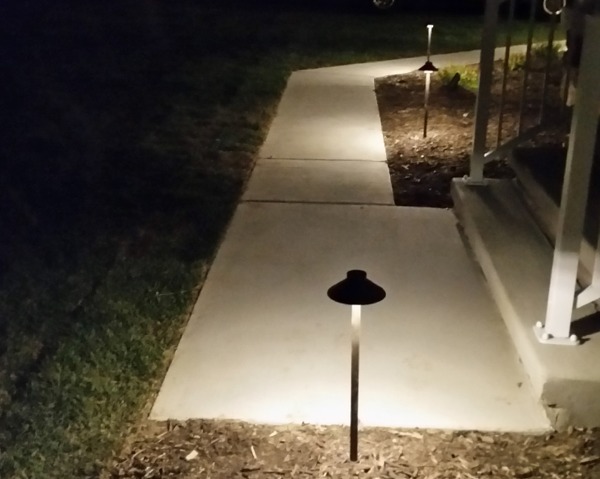 The yearly checking and repositioning of ground level fixtures that can be accidently moved from their intended lighting area by landscapers or maintenance crews is an important part of maintaining accurate lighting for your home and landscape. Low voltage lighting maintenance does not require a lot of bulb changes because the LED's outlast incandescent light bulbs, but nothing lasts forever, so checking bulbs is prudent. As a low voltage lighting contractor Ron Brown and his team service all of Ocean County NJ. Barnegat 08005, Barnegat Light 08006, Bay Head 08742, Bayville 08721, Beach Haven 08008, Beachwood 08722, Brick 08723, Brick 08724, Forked River 08731, Harvey Cedars 08008, Island Heights 08732, Jackson 08527, Lakehurst 08733, Lakewood 08701, Lanoka Harbor 08734, Lavallette 08735, Little Egg Harbor 08087, Long Beach Township 08008, Manahawkin 08050, Manchester 08759, Mantoloking 08738, Mystic Island 08087, New Egypt 08533, Normandy Beach 08739, Ocean Gate 08740, Osbornville 08723, Pine Beach 08741, Point Pleasant 08742, Seaside Heights 08751, Seaside Park 08752, Ship Bottom 08008, Stafford Twp 08050, Surf City 08008, Toms River 08753, Tuckerton 08087, Waretown 08758, West Creek 08092 and Whiting 08759 are all professionally served by Outdoor Living Landscape, LLC. Holiday Lighting Installation Toms River NJ by Outdoor Living Landscape, LLC.